ES6000 Hook Lock is suitable for swinging doors, sliding doors and is easily attached to wood or steel door frames. ES6000 is heavy duty designed with its high preload (side load) capability of up to 300 kg, high holding force of up to 700 kg and up to 4 hour fire rating. The ES6000 hooklock can be mounted vertically or horizontally and has a high holding force of up to 700kg. 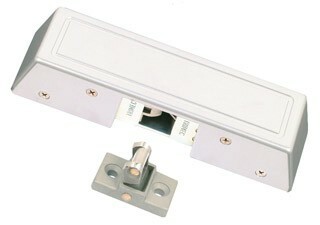 The lock is suitable for both sliding and swinging door applications.